← Napa Valley Harvest has Begun! But the green harvest is thinning that’s focused on uniformity of ripening. The clusters don’t all ripen at precisely the same rate, so as veraison, the color change, progresses it’s important to get into the vineyard a few times to see if there are clusters lagging behind – not coloring up the way they should – and thin them out. Sometimes the clusters have small “wings” jutting out at the top and they may not ripen as quickly as the main part of the cluster. So, off they come. Of course, the winemaker is concerned that those lagging clusters or wings might throw off the sugar averages (sugar is important because it determines the alcohol.) But another potential problem is the green, under-ripe flavors they may bring to the blend. And once all of the grapes have turned black, it’s impossible to know which are the laggards and which aren’t! The growing season here in Napa Valley has been a beauty, so far. At this time last year, an exceptionally cool vintage, clusters were thinned as a way to encourage the remaining ones to mature properly. 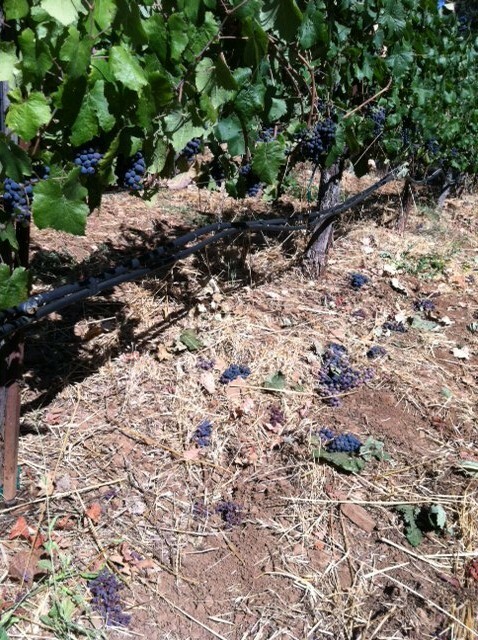 And, leaves were pulled away from the fruit zone in hopes that additional sun exposure would give the grapes a nudge. That won’t, likely, be necessary this year. I have to remind myself that this is the way vineyards are managed to make top quality wine. The cost of this kind of attention to detail would be prohibitive in value-wine production. It’s also an indicator of how much has been learned over recent decades. When I first got into wine (about 30 years ago – oh, my!) the vineyard regimen consisted of pruning in the winter, harvesting in the fall and not much else. Now, it’s almost like gardening with pass through after pass through throughout most of the year. They say the best wines come from vineyards with lots of footprints in them. In any case, if the weather continues as it has, we’re online for an excellent harvest. Keep your fingers crossed!